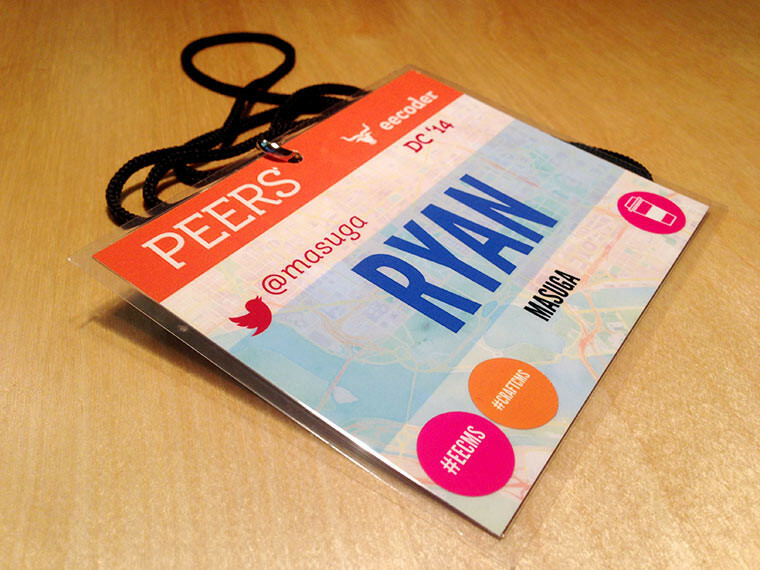 Last week I had the good fortune to attend (and speak at) the 2014 Peers Conference in Washington, D.C. This was the 2nd Peers Conference, and the 2nd I've attended. I'm now 2 for 2, and both of them have been great experiences. This post is a simple recap of events, conversations, and things I did, as well as an exercise in relentless name-dropping. I'll warn you ahead of time, it's a little stream-of-consciousness. I got in late Wednesday night. If I'm not traveling with my family, I like to keep the trips short, because I'm a real homebody and I miss my family when I'm away. Jessica D'Amico hooked me up with a great room on the 15th floor with a direct view of the Capitol building. Jess does a nice job taking care of people. Other conference organizers will want to take a lesson here in how she does things. After settling in, I walked a few blocks to the City Tap House where a number of conference attendees were hanging out. I had a conversation with Nevin Lyne of Arcustech (always great to run into @nevinlyne!) about subjects ranging from ExpressionEngine to RAID storage to Teslas. On the way out, I ended up in a chat with Ian Landsman (@ianlandsman), Nevin, Brad Bell (@angrybrad), and Paulo Elias (@pauloelias) about all sorts of things. I thought I had most of Thursday to work on the slides for my talk, but before leaving, Jess casually mentioned she needed my presentation before 6 am, so it was back to the room for me to finish up my Keynote slides. Had a great discussion with Matt Stauffer (@stauffermatt) about project management, and Lamplighter.io. His questions really helped me think about who we're marketing Lamplighter to, and how I might tailor our content and copy going forward. My talk got moved up on the fly from 3:15 p.m. to 1:30, and I found out about it at the last minute, so I went to eat a quick lunch with Kevin Barr (@burst_creative) and another fine fellow whose name I can't recall! My talk about building Lamplighter.io on Laravel (Slides on Speakerdeck) went well (particularly in light of the fact I never did a full real-time read-through) and I had to forward slides on two machines because the machine my notes were on was not the machine that was projecting slides. There was some good Q&A at the end (Thanks for your Q's, Pete, Michelle and Caroline) that led to me talking (rather passionately) about the internal projects we've worked on to keep track of stats for our SuperChexx bubble hockey game and our ping pong games. Maybe I should talk about those sometime. Just need the right conference. I had a great conversation with Lodewijk Schutte (@low) about ExpressionEngine add-ons and add-on sales through devot:ee. He showed me the dashboard he built with Laravel that parses his add-on sales data that he gets through the devot:ee API. That evening I had dinner at Birch & Barley (555 beers? Are you kidding?) with three guys from Synergema (@synergema: Chad Clark @chadclark, Brandon Haslip @bhaslip, and Michael Reiner @radarseven - all funny guys), Brad Bell, and Anthony Colangelo (@acolangelo). The restaurant was featuring beers from Bell's Brewery in Michigan. I had to laugh because I can travel across the country but never get away from Michigan beers. I ended up having a Bell's Two Hearted (one of my faves) poured from a cask. Conversation was all over the place and very funny, especially when we got into goats and the Illuminati-controlled tunnels in Minnesota. I'll never look at a goat in the same way. I crashed like an old man around 9 p.m., never to head back out. It wasn't my plan, but I was thoroughly exhausted. That proved to be too bad, because there were people I wanted to talk to and I never got a chance. I thought I might see some of these people at the after-party on Friday, but I was never able to connect with them. Maybe next time! I had breakfast in the hotel with Ben Parizek (@BenParizek), where we discussed the relative merits of usingExpressionEngine and Craft for different projects. Conclusion: use the right tool for the job. I walked into the Day 2 venue a bit behind, as Hampton Catlin (@hcatlin) was slaying the room talking about the creation of Sass and his days wearing a red mohawk. Jess hooked everyone up with gourmet pizza and pie for lunch, and the coffee was good and neverending. Did I mention Jess knows how to take care of people? During lunch, I spoke with Ian Landsman about his products Snappy and Helpspot. We're trying to find the right product to use for customer support with our services (lamplighter.io and devot-ee.com) and I'm thinking one or the other of his products will fit the bill, so it was a good conversation to have. I broke out the red shoes. Danielle LeComte would approve. I got into a conversation with always entertaining Tim Kelty (@timkelty). Even though he works in the same city as I do, and is only a mile or two away, the only time I see him is at conferences. There is some strange rule that we have to be more than 200 miles away from Grand Rapids in order to talk to one another. I met Danielle LeComte (@daniellelecomte) and we had a great talk about ExpressionEngine, Lamplighter, our web development companies, and the fact she went to Michigan State and I attended Michigan. She nearly walked off when I revelaed that I bleed blue. To close things out, Ian Landsman gave a very funny and informative closing talk about "Mistakes," one of which is giving two different presentations 8 days apart (he had just spoken at MicroConf the week before). After day two wrapped up, I walked back to the hotel with Anthony Colangelo (@acolangelo). As the rain started to come down, we shared stories about how we each got in to the web development world. The differences are interesting, me being in my 40's and he in his 20's. There was no web development when I was in school, and I didn't even have an email address until my senior year of college. Anthony and I then walked through the pouring rain to the to the conference after party at Iron Horse where beers were on…somebody…for the next couple hours. I had a great talk with Josh Conner (@_JConner), Justin Kimbrell (@justin_kimbrell) and Eric Lamb (@mithra62) about devot:ee and the course my team wants to take with it in the future, which I formalized yesterday on a devot:ee 2.0 page. I participated in an absolutely horrible game of shuffleboard, teamed with Jon Thomas (@wjonthomas). We were destroyed by Erik Reagan (@erikreagan) and Pat Pohler (@patpohler). We moved on to dinner at Hill Country BBQ, which was incredible. More great conversation took place here with Erik Reagan, Brett Burwell (@thisisstatic), and Eric Lamb about contracts, lawyers, business insurance, personal assistants and company growth. After dinner we headed to Jackpot for more talk and drinks. Here is where I had one of the most productive and useful talks I had during the entire trip. I discussed ways in which devot:ee and Lamplighter might be more tightly integrated with Brian Davis (@brianmdavis) and Jon Thomas. I came away from this talk with a desire to get right to work. I had an early flight the next morning, so I made the rounds, saying goodbye to everyone there. As I gave Jessica a farewell hug, I knocked….no, karate-chopped…a beer out of Chris Newton's hand. The place grew silent, and Chris decided to let me live. Cross one more thing off my bucket list. I got up at 4 a.m. for an early flight home. The plane blew a tire when landing in Detroit, so I missed my connecting flight home to Grand Rapids (so much for trying to me home by 11am!). That gave me a couple extra hours to get my presentation slides up on Speakerdeck: Building Lamplighter.io on Laravel, and to think back on all the conversations I had. One thing is clear: conferences reenergize me to work on things and completely wear me out at the same time. Online communities and friendships are great, but there is something about meeting people in person that you can't replicate. Meeting with these people in person makes me want to take care of them and support their needs, and these meetings carry with them a certain sense of urgency for me. The introvert in me naturally gets worn out having all those conversations and constantly having to be "on", though. I'm glad to be home, but I'm also glad to have a renewed sense of direction and fire to get things done that I might be lacking had I just stayed home last week. Peers Conference 2014: great time, valuable interactions. Highly recommended; would do again.